Santa Margarida is one of the best known and most visited of all the volcanoes in La Garrotxa. Close to the Olot-Santa Pau road at the foot of this volcano there is a large car park from where many walks depart. 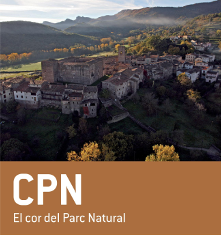 One of the best is Natural Park Itinerary 1, a circuit that climbs the volcano before continuing on to the famous beechwood, Fageda d'en Jordà, and Croscat, one of the other spectacular volcanoes in the area. Geologically, Santa Margarida is the product of more than one type of eruption. Although initially formed by Strombolian eruptions, the final phases of the eruption were much more explosive and gave rise to a circular crater, instantly identifiable today by the church of Santa Margarida de la Cot, Romanesque in origin, in its interior. Aside from the crater, which today is grazed, the rest of the volcano is covered by thick forest, with holm oaks on the sunnier south face and deciduous trees on the north-facing flank.